Despite the costly overheads associated with taking an annual holiday, figures show the majority of Brits are prepared to dig-deep and travel somewhere exotic when the summer comes around. 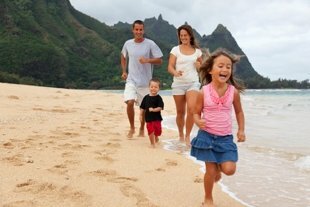 To help hard-working families save a few bob on their next trip, we’re here with 14 ways you can save money on this year’s family getaway. Although the pound is currently performing well against the dollar and the euro, it still pays to search for the best deal on foreign currency when travelling overseas. Before you head to your local bureau de change with a fistful of sterling, go online to check which high street provider is offering the best deal. If you’re finding it tough to prise the kids from their smartphones, for goodness sake – make sure their mobile data is switched off. Parents naïve enough to let their kids have full rein of their mobile could be met with bills as high as £10K upon their return to the UK, and all for the sake of a few Instagram pics. Some hotels and holiday apartments offer free wireless to all guests, so if internet connectivity is a must, be sure to book accommodation with inclusive Wi-Fi. Insurance is often cited as an essential pre-holiday item, but depending on your individual circumstances, it isn’t that big of a deal. If you’re travelling to Paris, Barcelona or Berlin for a weekend break for instance, holiday insurance isn’t necessary – provided you have your EHIC card. An EHIC will enable you to access state-funded healthcare in the EU, eliminating the need for costly insurance. If you’re travelling further afield however, holiday insurance is vital; using a comparison site will help you find the best deal, but expect to pay as much as £50 for comprehensive cover for a family of four. When it comes to booking flights for your family getaway, it pays to have a strategy. Depending on the time of day and day of the week you go for, you could save a fortune on your travel costs. Industry insiders recommend booking outbound flights on a Tuesday rather than a Friday – whilst early morning and evening flights are often considerably cheaper than peak times. Use a flight comparison site like Skyscanner to find the cheapest flights on your desired dates. If you’re in the market for a cheap family getaway, an online travel agent is a good place to begin your search. Travel agency sites offer competitive prices and there’s one for every type of holiday. For cheap package deals try Flight Centre or Icelolly.com, or if you’re for a particular type of holiday, check out specialist agents like Crystal or Cruise1st UK. The internet is awash with travel agents offering holidays at rock-bottom prices, so it pays to shop around and do your research prior to booking. 6. How About House Swapping? If you’re looking to save major bucks on your next family break, why not consider house swapping? For those who haven’t seen The Holiday: house swapping involves trading places with a family in a destination of your choice – as in, you stay in their home, they stay in yours. Although house swapping isn’t for everyone, it could save you thousands on your next family holiday. There are several agencies on the web that specialise in arranging house swaps, and they only ask for a £100 annual fee for their services. Check out The Guardian Home Exchange for more information on holiday house swapping. Holidays with close family are all well and good, but if you want to save on your accommodation costs it could pay to travel with extended relations or family friends, too. Booking a holiday apartment or villa for a family of four can be costly – so why not spread the cost by booking a break with friends or relatives? If there are two or more paying couples, the amount you’ll need to shell out on accommodation could be slashed by as much as 75%. Web savvy surfers with an eye for a bargain may find it useful to sign up to certain travel websites when planning a family getaway. Sites like Expedia, Travelzoo and Travel Supermarket provide an e-mail newsletter detailing the week’s best travel deals – and there are often some real bargains to be hand. It’s free to subscribe to most newsletters offered by travel websites, and who knows – your family holiday could be an e-mail away. When it comes to booking the annual summer holiday, people have different preferences. Whilst many like to secure their booking early in the year, some are brave enough to leave it until the last minute – often making huge savings on their holiday costs. Figures show however, that those who book early will get just as good a deal as those who wait; it’s families who book somewhere in the middle that end up paying over the odds for their holiday. Take our advice: book early or book late. With a host of hotel and flight comparison sites offering cheap travel and accommodation costs, holidaymakers can often be mislead on how best to book their family break. Whilst booking flights and hotels separately can prove cheaper on certain occasions, the humble package holiday remains the cost effective option for families – so keep checking the window of your local travel agent. When buying or booking anything online, get into the habit of doing a quick search for discount vouchers or codes before you hit proceed. A number of sites make it their mission to compile vouchers and codes from a range of different websites – including flight, hotel and holiday booking sites. Strike lucky, and you could receive a considerable discount on the cost of your holiday. In the excitement of packing for an imminent family trip, luggage weight and size restrictions can often be overlooked. To avoid nasty fees for overweight luggage at the departure gate, be sure to weigh and measure each item of luggage before you travel to ensure it complies with any restrictions imposed by the airline. Those feeling peckish aboard a long-haul flight will be all too aware just how costly in-flight meals and snacks can be. For meals and drinks for a family of four, it could end up costing you over fifty quid – a costly overhead if you have a strict holiday budget. Instead of paying through the nose for in-flight fodder, pack a plane picnic before you travel; just remember, you’ll need to buy drinks in the airport once you’ve passed check-in. Excursions are a great way to take in local history and culture during your holiday; sadly however, they can prove costly. Instead of booking excursions through your hotel or tour operator, arrange excursions independently to save a shed load of cash. Tour operators charge a fee on top of the cost of admittance at a particular point of interest, meaning you pay extra for something you could easily arrange yourself. Travel as a group would definitely save you money. There are lots of promos that hotels and other tourist spots offers. Me and my friends are planning to have a vacation by next year and we are also looking for promo tickets online.